Without the addition of landscaping accents, some fences can look a bit one-dimensional and bland, contrasting drastically with your home and your yard. However, using just a little ingenuity and planning, there are several different ways to soften the edges up and create an outdoor space that will be not only more visually appealing, but also create a more relaxing, enjoyable setting for you and your family. 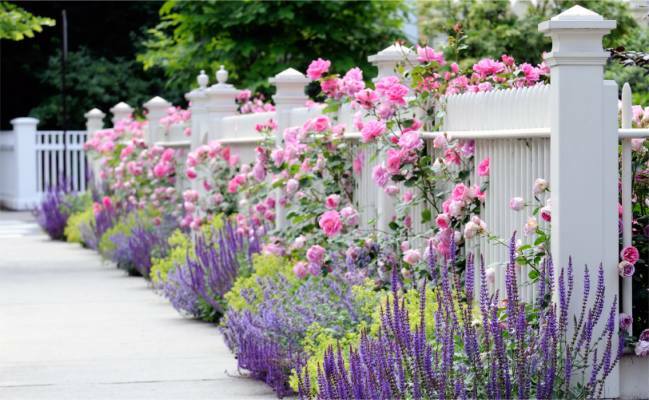 Getting good visual appeal from your fence starts with the selection of the fencing itself. It's important to choose fencing materials that match both your needs and the architectural style of nearby structures when making your decision. There are a wide variety of fence types and the one you choose will reinforce the "tone" of your yard; is it fun and casual, or is it ornate and victorian? Using organic materials (or at least those that look organic) will create a natural, or even rustic look; whereas using synthetic monotone materials will make it look more modern. 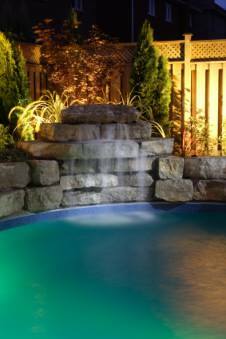 Using creative materials as posts for your fence, such as real or faux stone columns, can also alter the feel. The possiblities are nearly limitless...and that's before you even think about the rest of the landscaping. Different types of fencing may require different levels of creativity in getting them to blend in seamlessly with the surrounding landscape. 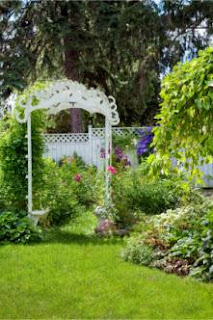 Don't forget to think about the level of privacy each type of fence provides as you think about what types of plants to include. Some fences, such as rail and chain link types, still allow a clear line of sight while other fences like vinyl and composite fencing obstruct views and require additional landscaping features to help appear more in tune with their surroundings. The height of a fence is also an important consideration. For example, a short white picket fence may look just fine with a small bed of shrubs and flowers planted in front of it, while a 5 foot chain link fence might need more to make it fit in. For fences such as chain link panels, you can try using them as trellises for climbing plants like morning glories, clematis or even vegetables like snap peas or scarlet runner beans. Incorporating your fence into your vegetable garden can be both practical and cosmetic, providing support for plants and helping blend the fence into the aesthetics of the yard. Incorporating a water feature, such as a pond, into your landscape near your fence presents an opportunity to create a different focal point in your yard other than the fence itself. In addition, landscaping accents, such as arbors and pergolas, can also be used to incorporate both shaded areas and vining plants into your outdoor oasis.Blending the two features together through the use of plants of varying heights, textures and depths can give the entire outdoor space a more natural feel and make the fencing seem as if it were a natural part of the landscape. Dependent upon your space limitations and climate, using tall grasses, dwarf trees and bushes in the area surrounding your fence and pond can provide depth and can be used to highlight features of your fence you enjoy, such as ornate gates, panels, or posts. Once you've softened the lines of your fence with landscape accents such as ponds, creative fencing materials and plantings, focus on making your outdoor space useful no matter what time of day it is. Installing solar post caps on your fencing will make your outdoor space memorable and enjoyable even in the evening hours without impacting your budget. Not only will you enjoy your yard later into the evening hours, outdoor lighting can also help to highlight your beautiful yard for the rest of the neighborhood to enjoy as well. Creatively planning how a fence fits into your landscaping can be a great opportunity to combine the customized outdoor look you've always wanted with the privacy and security you and your family need. 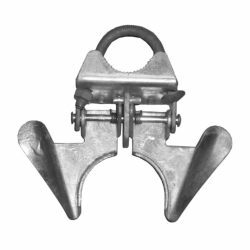 A Butterfly Latch is a spring-loaded, self-latching gate latch designed for use with for chain link swing gates. They are easy to install and operate, which makes them popular for residential fences, particularly chain link pool fences when used in combination with spring gate closers. How Does a Butterfly Latch Work? When the gate makes contact with the latch, the momentum of the gate lifts the angled front end of the latch up, opening it. The gate then hits the back of the latch, which stops its forward momentum. With nothing to hold it open, the springs in the latch quickly close the front end so that the gate cannot swing back out. If you've ever built, or planned to build, a fence, then you've probably run across the issue of how long your fence posts should be; particularly if you weren't using a pre-fabricated system. 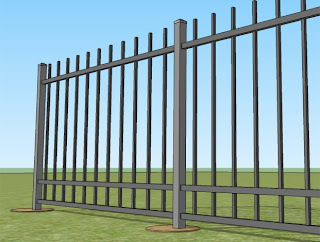 With little to no experience, choosing the right length fence posts can be a confusing issue. 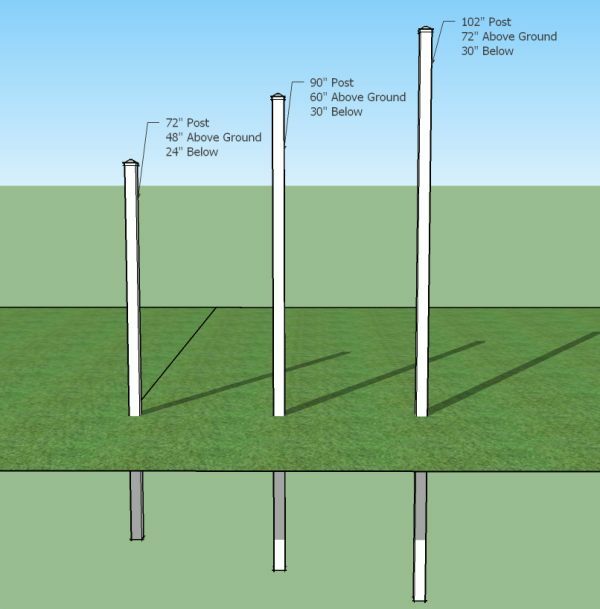 Luckily, there is an easy to remember rule of thumb that many professional fence installers use to determine the height of their posts. In general, 1/3 - 1/2 the height of your fence should be below ground, with a minimum of 2 ft. What this means in practice is that if you have a 4' high fence, your posts should be 6' with 2' below ground. If your fence is 6', then you should use 8 1/2' - 9' posts with 2 1/2' - 3' below ground. If you follow the guideline above - for most standard fence systems - your posts should be deep enough to provide strength and stability for your fence. However, if you live in an area of high wind or extreme cold, you may want to opt for a longer post, because it will make your fence less vulnerable to the elements. 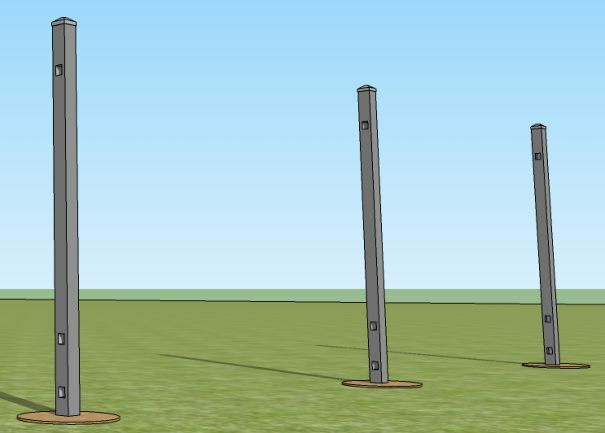 On the other hand, if you are installing an light ornamental system in a low wind area, then you may be able to get away with shorter posts; although longer posts won't hurt. 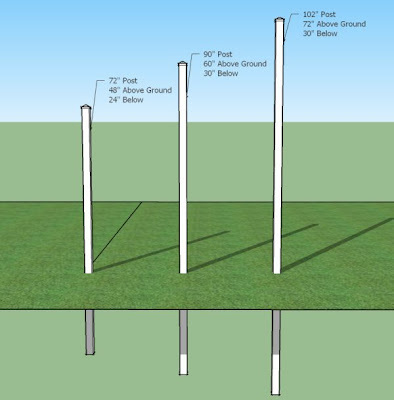 If you plan to use a drivable post anchor like Oz-Posts to install your fence, then the Oz-Post is the underground extension of your fence post, so a 6' tall fence should have a 3' Oz-Post and 6' wood, vinyl, aluminum, or steel post. What is a...Routed Fence System? A routed fence system is one that uses pre-cut holes in the posts to hold the panels in place, instead of brackets and screws. The holes, which are precisely machine cut into the posts to match each specific fence model, are depedent on the post's function; which means that there are different posts for lines, corners, ends, and gates. The panels usually either snap into place, or are secured using lock rings, depending on the type of fence. Contrast this with a bracketed system, where all of the posts are blank and brackets are screwed into the posts to hold the fence panel in place. 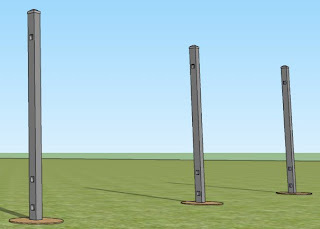 Illustration 1: A series of routed line posts for a 3 rail fence system. Illustration 2: Routed fence posts with panels inserted. Why should I choose a routed fence? 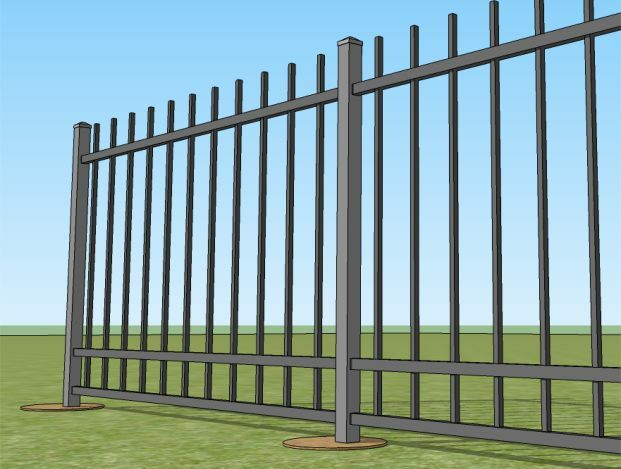 Of course, the fence you choose will depend on your specific needs, but in general routed systems offer several benefits that bracketed systems can't, including: no visible screws or brackets, typically a lower cost per foot due to reduced hardware requirements, and ease of assembly.